The story of Marsha “Pay It No Mind” Johnson is bitter-sweet, and probably for this very reason needs to be told again and again. Johnson (1945-1992) was a Black gay rights activist and NYC drag queen. She was one of the brave activists who incited the Stonewall Riot of 1969. The Stonewall Riot was a pivotal point in the modern gay (LGBTQ+) rights movement. In NYC in the ’50s and ’60s, the police routinely raided gay bars to arrest gay and trans patrons. In 1969, Marsha and her peers responded to police violence in kind. For many people on the University of Utah campus, 1969 can seem so far in the past, but to some Queer Black students not much has changed. “Many of those same kinds of tensions that Marsha P. Johnson attempted to address, we still have to address on campus today. Often, I’m put in situations where I have to choose between being Black or Queer, but I’m tokenized for both,” said Romeo Jackson, a graduate student, a teaching assistant and a femmetor (fem mentor). From marriage equality to the mainstreaming of RuPaul’s competitive reality show, Drag Race, things have seemed to progress in society. Yet, according to various LGBTQ+ activists and organizations, Black queer folx and trans people of color are continually erased, abused, and murdered. The Human Rights Campaign reported that as of November 2017 at least 28 trans people have been murdered. Organizations like the Trans People of Color Coalition have highlighted that the media still has a long way to go in correctly naming and identifying transgender people when they are murdered. With at least two trans deaths a month, and knowing that there are many more who go unnamed and misgendered, there is still progress to be made. Being critical of progress (or the lack thereof) for Black trans people has had and continues to have mortal consequence. Johnson herself died in 1992 under suspicious circumstances that are still contested today- while officially recorded as a suicide, many of Johnson’s peers point to police violence as her cause of death. Our campus’ celebration of this years’ Black History Month offers critical engagement with the past, present, and future. On February 8, 2018, the University of Utah’s Black Student Union will be sharing David France’s version of Johnson’s story by screening the Netflix Original, (2017) The Death and Life of Marsha P. Johnson [Documentary]. This documentary investigates the mysterious death of Johnson in 1992 and is readily accessible with a Netflix membership. If you have already watched or plan to watch David France’s version of Johnson’s story, consider putting it into dialogue with the film, (2016) Happy Birthday, Marsha! [Film], an independent version of Johnson’s story that was directed and produced by Reina Gossett, a trans women of color. Gossett tells the story of Johnson’s life in the hours leading up the Stonewall Riot. 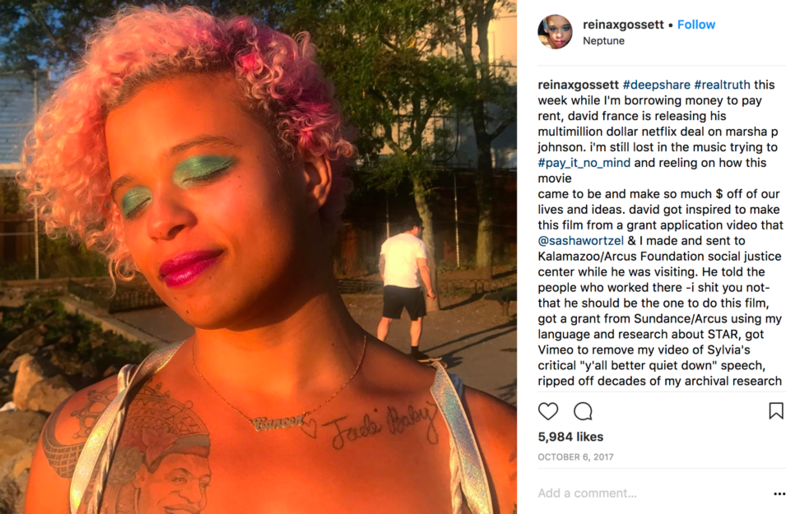 In 2017, Gossett accused France of stealing her film concept and research on Johnson, subsequently garnering France a multi-million dollar Netflix deal while Gossett shared (via Instagram) that she was left “borrowing money to pay rent.” According to the Inter-American Commission on Human Rights’ 2015 report, Violence against LGBTI Persons, Trans people of color are in a precarious situation, wherein their life expectancy is half that of cisgender people. Additionally, like Gossett, the work of trans people and trans people of color is often devalued and dismissed. During this year’s Black History Month, celebrating Black life means elevating the narratives of Black trans people. Seemingly, the narratives have not changed much, which is concerning in and of itself. Black trans people have been persistent in surviving in the face of institutional race and gender oppression. Stories, like that of Johnsons’, while bitter-sweet, must be told again and again, because hers is a story of what it means for America to be America.